A radical new book about the Participation Age, for everyone who: has a job, owns a company, or manages people. 1) With no titles, no departments, no corporate ladder, no office hours, unlimited vacation time, and profit sharing for everyone. 2) That invites the whole person to work, not just the part tied to the machine. 3) Where leaders hire people they will never have to manage, in fact where there are no employees or managers at all, just Stakeholders. 4) With no written policies or HR department, because rules destroy creativity. 5) Where the driving force is Making Meaning, not just money, and as a result, everyone makes a lot more of both. Why Employees Are Always a Bad Idea is about these companies. They exist right now, in every industry, with five Stakeholders to 10,000. And everybody wants to work there. Why Employees Are Always a Bad Idea will transform employees into Stakeholders, and turn managers into Leaders who know how to eliminate archaic business practices to move their companies in to the Participation Age. A new, must have business book by the author of the #1 Rated Business Book of 2010 (NFIB), Making Money Is Killing Your Business. The marching orders of the traditional office are: show up early, leave late, shut up, sit down, don’t make waves, live invisibly, and worst of all, go out quietly at retirement. Employees are told when to show up, what time recess and lunch are, and exactly what they should do while they are there. Pretty much the same way we would treat a five year old. That won’t work anymore. We have entered the The Participation Age, and the hallmark of the Participation Age is sharing. Today, people won’t put up with being treated like children, locked down daily 9 to 5 in the office day care center, and told exactly what to do. They demand to share in the creative process of building the company together, and in the rewards that come from doing so. 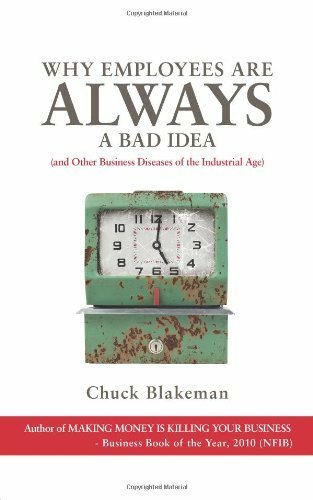 Why Employees Are Always a Bad Idea confronts the seven core business diseases of the Industrial Age that were developed for the Factory System. Those management practices will not serve us anymore. We got great toys from the Industrial Age Factory System, which dominated the way we worked for over a century. But the human carnage of the Industrial Age is the unaddressed collateral damage of how we produced those toys. There is no turning back. The Participation Age is not optional. As the Industrial Age fades in the rear view mirror, the workforce is demanding that we create a new workplace. A growing wave of companies are building the future of business, where both the company and the Stakeholders can Make Meaning while they also make money. The Participation Age: No departments, no titles, no managers, no employees, no HR department, no written policies. Just self-motivated, self-managed, self-organized teams producing higher profits in less time, in every company in the world. Thousands of them are already here.